Ice or cold therapy is one of the best therapies for relieving acute pain, swelling and inflammation in the body parts. The therapy is highly helpful in painful conditions like sprain, strain, traumatic injury, hit or fall injury, post-surgical pain, etc. The procedure of delivering ice therapy may however differ which usually depend on things like: the site of pain, severity of pain, the intensity of pain, condition of the patient, etc. It may also vary according to the chronic problems or diseases, the patient is already suffering with. Your doctor may recommend you the alternates between some of these highly efficient ice packs which are best for delivering the benefits of cold therapy. How Does Ice Therapy Work And Benefits? Heat or Ice for Neck Pain: What to Choose and When? While you are suffering from back or cervical pain, your physical therapist will alternate between hot and cold therapies. By using heat, the physical therapist seeks to get more blood to the target area because an increased blood flow brings more oxygen and nutrients to that area. Blood is also needed to remove waste by-products created by muscle spasms, and it also helps healing. Ice or cold therapy (also called Cryotherapy) is generally recommended by doctors in case of acute or sudden pain followed by swelling. Cold therapy slows down the circulation, helping to reduce inflammation, muscle spasms, and pain. You may be advised to place a cold pack placed on the target area or an effective ice massage given by the therapist. The acute pain is normally self-limited and it is always confined to a particular part of the body. The duration and severity of the acute pain also lasts only for few minutes and in very rare cases the acute pain moves to a chronic state. In case of all acute pains the application of short and intermittent cold application gives good beneficial results. As such there are 3 different types of ice packs or application methods available in the ice therapy procedure which helps in providing the relief from pain. 1- Reusable Ice Packs: Mostly available in the form of gel filled packs or bags these are the most common of all. These packs can be kept in refrigerators for to use at times when needed. These ice wraps are made of flexible soft rubber material (same like the hot water bag) which can be re-frozen and can be used multiple times for years. These cold pack bags are mostly available in round shape where a cork will be fitted at the center through which you can pour the ice cold water or ice cubes directly. 2- Disposable Ice Packs: These are the instant ice packs which are less common in nature. These packs need to be cracked by hand which then spur a chemical reaction making the pack cold instantly. These packs stay in cold condition for longer of time provided they are used at room temperatures. 3- DIY Homemade Ice Packs: For those who are DIY types and want to make their own ice packs at home can try making these packs by things they already have available at their home. Old age people who often suffer from problems like arthritis, can make use of these instant home made ice packs (to reduce their inflammation and swelling) as and when required. We will get into detail about some of these DIY methods below. Below are some of the best ice packs and bags that can be used for getting the neck and back pain relief. You can read detailed review about them along with consumer ratings before buying one. Chattanooga ColPac is specifically designed according to your neck contours and it happens to be one of the best applications for soothing your muscles after experiencing physical pain from a severe injury. It delivers you quick relief to your strained muscles resulting from a temporary inflammation. This 23 inch ice wrap can be used conveniently to bring in relief from trauma which results from bruises, sprains or sudden swelling of soft tissues due to free fall. Duration for using this ColPac remains to be thirty minutes at one go. Serving the humans for long Chattanooga ColPac happens to be a most popular ice pack that is being used and recommended by professionals related to sports industry. Physical therapists also recommend it for soothing muscles as it is made up of latex free material and is filled with non-toxic silica gel which makes it safe for all ages. Flexikold neck cold pack by NatraCure is one of the most flexible and professional cold pack that can easily bring instant relief to your aching muscles. Physical properties of this cold pack are enhanced due to a gel which remains to be an active ingredient. The gel remains pliable when frozen and hence allows a better contact in the concerned area to bring in an instant relief to the patients. Available in various sizes, which is referred to as Standard, Oversize, Half size, & Neck Contour, Flexikold pack offer a complete satisfaction to different patients suffering from muscular pains. This Flexikold neck cold pack stays colder for long and offers an intense effect which lasts longer for better relief. And for this reason most of the health care professionals recommend it for relieving muscle pain, injuries swelling as well as chronic pain such as arthritis neck pain. This washable and reusable ice pack is provided with an extra nylon exterior to offer extra protection. Mueller ice bag is an awesome reusable ice bag for muscle pain relief which is much economical. In case you are in need of a comfortable and easy to use ice bag, this is just for you. Made from latex free materials it is highly comfortable and durable. This 9 inch Mueller ice bag is ideal for cold therapy application for reducing the pain, inflammation and swelling caused due to muscle aches, sprains, bruises, minor scrapes, etc. Just add the ice cubes, crushed ice or simply the cold water to the bag and use it for half an hour. Reusable Coldest Ice Pack – Gel is another great cold/hot pack which is best for painful conditions in back, hips, shoulders, neck and ankle. It is a must have for active sports players and professional athletes who are prone to getting sprains, or muscle spasms much often. 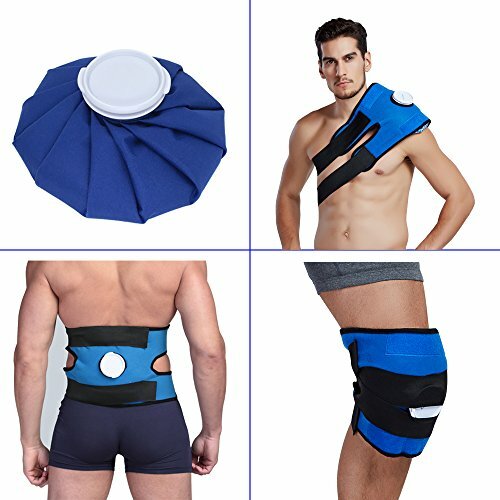 This reusable gel based ice pack for back pain is manufactured and marketed by The Coldest Water ® and is great to have in your home for faster muscle injury recovery. It molds or conforms to the body area very fast, for providing the maximum comfort to the users. You can store it in freezer (for about 2 hours) or place in the microwave (for about 30 seconds) for to enjoy the benefits of cold and heat compress therapy respectively. This high quality ice gel pack comes with a Velcro strap which is wide and long enough to wrap around your waist (or other body part) in a much comfortable and secure way. Elasto-Gel is a large cold pack which is great to use for your painful shoulders and legs. It comes with adjustable side flaps and a detachable extension strap to securely wrap around it on the body part. This reusable ice pack can be used repeatedly as it is made up of high quality durable material which lasts for long. The best benefit of using this pack is, unlike other ice packs it does not leak in case, it gets punctured accidently. This Elastogel ice pack is microwavable and thus can be used as a hot pack when required. It comes with a cotton cover and is made up of latex-free material which makes it much comfortable and safe for users. For ultimate pain relief and proper injury treatment, TheraPAQ Pain Relief Ice Pack with Strap for Hot & Cold Therapy is the ultimate product to watch out for. It is much better in action when compared to a hot water bottle or lighter gel pack. It is available as a hot and cold pack with Velcro strap, which can wrap around the waist or any part of your body comfortably. This ice pack by TheraPAQ is a perfect mechanism for relieving you from stomach aches, lower back pains, shoulder and stiff neck. It is a recommended product by most of the chiropractors and physiotherapists, to be used post-surgery of shoulder, hip replacement or as knee recovery. It is even stated to be suitable for calves and ankles, arms, shins, elbows and wrist. As it is available with Velcro strap, therefore; it will provide complete relief with proper mobility. Users can just wrap it around the affected area, and it will start working its magic immediately. Even when it is frozen, the wrap remains flexible, making it smooth enough to move. Cold therapy is primarily recommended for first 48 hours after injury. Make sure to store the gel pack in freezer for a minimum of 2 hours before using. For any injury treatment and pain relief, Koo-Care Pain Relief Hot Cold Therapy Reusable Ice Bag Pack & Wrap is the perfect solution. This wrap is a perfect addition to relieving back, shoulder, head and knee pain. This reusable cold therapy pack comprises of an ice bag with Velcro wrap and 2 Velcro straps. It is a hands-free design, and it helps in keeping the ice pack in its place. This product is perfect for applying cold or heat compress, anywhere near the affected areas. The cold therapy of this wrap from Koo-Care serves as a multipurpose element. It is best suitable for fever, headache, sprain, toothache, bumps and even for other sports injuries. On the other hand, its hot therapy is a perfect relief for muscle spasms, pain, strain, sprain, and stiffness. This product is known for its leak-proof lock, which will prevent water from spilling out from the container. It is a latex free item, which is FDA and CE certified. It’s a one size fit all item and ensure heat and cold to last longer. The hands-free design makes the item perfect for use, while on the move. It offers complete relief from long term pain and strain, within a jiffy. Immediately after applying the ice over the painful area, due to sudden vasoconstriction, the part will feel the numbness which leads to sharp shooting pain. This pain lasts for few seconds and then gradually subside along with relaxation in the deep tissue acute pain. The mechanism of action by which the ice massage acts effectively in case of acute pain is by shutting down the pain gate response. While giving the ice massage to the stiffed or pulled neck, the neck or back should be positioned properly, if needed it can be elevated slightly. Most of the times within two to three days of ice massage administration, the pain will subside a lot along with reduction in swelling. Normally for giving ice massage you can use the ice cubes covered with a cotton cloth or with the help of a ice bag which are available nowadays readily at the online stores and medical stores. These ice bags are reusable and lasts for long for providing you the instant relief from the acute pain as and when required. The DIY homemade ice wraps for neck and shoulder pain is an excellent ice therapy tool which mainly retains the cold temperature for a longer period of time. 1- Ice Cubes, Plastic Bag and Towel: The normal ice cubes from the refrigerator is the general and simple tool used in ice therapy. The ice cubes of any size can be placed in a small sealable plastic bag and then the bag should be covered with a good clean cotton towel. The cold bag enclosed with the towel can be then used as a neck ice pack for getting the benefits of ice therapy. The ice cubed towel should be gently applied on the painful areas to relieve the person’s severe acute pain. This type of natural ice pack helps to prevent the cold bites (or ice born) to the therapist’s hands (as well as to the skin of user) when administering the treatment. And at the same time the patient also will be benefited much with this application as it provides the total direct contact of the very cold ice. 2- Frozen Sponge or Towel: Take a small piece of sponge and make it partially wet. Place this in a sealable plastic bag and allow it to freeze in a freezer. After it gets frozen (in about half an hour) it can be applied to your sore joints for getting the relief. If required you can wrap the baggie with a towel or cloth to protect your skin from direct ice burn. Similar to a sponge, you can also make use of a frozen towel for making your diy cold pack. Take a clean damp towel. After folding keep it in a plastic bag and allow it to freeze in the freezer. Now you can take out the frozen towel from the bag and place it directly to the affected sore area. 3- Rice and Sock: I am sure, not many of you have tried this before. You can take a clean piece of sock and fill it with rice. Lock the open end using a safety pin or few stitches. Place the pack in the freezer and take this frozen rice pack out after an hour. The main benefit of using rice is in this ice bag, it get cold as much as ice but does not melt fast while you are using it. 4- Gel Type Ice Pack: This can be made by using liquid dishwasher detergent and a plastic baggie. Fill the baggie with the liquid detergent and allow it to freeze in a freezer for about half an hour. This type of ice pack provides a consistency of an actual gel pack which are available in the markets. 5- Frozen Vegetables and Peas: This is real exciting and a fastest way for getting the treatment. You can use it in case you are in need of ice therapy urgently. Take a frozen bag of peas or other vegetables from your freezer, after wrapping it in a clean towel or soft cloth you can apply it to the affected painful area. Should I use ice or heat for neck pain? This is a question that is often asked by many when they want to use ice or heat therapy for treating the pain in neck, shoulders or back. To be true, the real answer is “Both”. Simply saying, there can be different pain causing reasons and the basic reason that causes the pain or inflammation should be treated. It is based on this reason the decision relies about which treatment has to be adapted. When is Ice Pack Prescribed? Ice pack is prescribed and used for cases like fresh injuries and tissue fatigue or chronic overuse injuries. Applying heat increases the inflammation and causes more inconvenience in such cases. Therefore Ice packs work well in these scenarios and help relieve the pain. Fresh injuries are the injuries which bring physical changes to the skin. The skin becomes hot and red in colour when met with a fresh injury. The skin also becomes very sensitive to touch. This means that the injury is still fresh and treating such injuries by applying heat therapy increases the inflammation caused due to the injury. The pain also magnifies if heat is applied on such injuries. These kinds of injuries should be thus treated with ice. Ice is useful for cases like Tissue fatigue or chronic overuse injuries too. There are many cases in which this condition happens like in carpal tunnel syndrome, supraspinatus tendonitis, tennis elbow, patellofemoral pain syndrome, iliotibial band syndrome, plantar fasciitis and shin splints. Muscles contract often which results in severe pain leading to muscle spasm. The facet joints that belong to the spine get inflamed or injured and this results in lower back pain. This sometimes limits the movement of the body. Heat treatments work well on these types of muscle spasm. Pain on trigger points like the tender areas of the muscle should also be treated using heat treatment method. Lower back pain and neck pain are usually treated by using heat therapy. Using cold treatments in such scenarios increases muscle spasm and pain in the trigger points are increased that lead to severe muscular pain throughout the body. Although using ice packs for massage benefits greatly in relieving the bodily pain such as neck and shoulder pains, it can adversely affect your health if not used properly or without proper care. Avoid ice application directly on the bone surface. In fact always administer the ice massage in the fleshy parts of the body. Give the ice massage till the particular area gets cold and pink but not numb. Numbness is a dangerous symptom which should be avoided in ice therapy. Always give the ice massage with slow motions. Keeping the ice static on the body surface will cause immediate numbness which may also lead to aggression of pain. In case of minimum or no improvement at all (even after taking the ice massage for several times) consult a good physician immediately and check out the main cause of your pain. Overall, applying ice or cold therapy with the help of ice packs is a wonderful way of providing relief from painful conditions. If you are suffering from painful conditions and haven’t tried it yet, you should give it a try as a very first aid. As this is all natural you will love the benefits it provides to your paining body parts.